SPECIAL OFFER: How to Get FREE Gold Storage! That’s where some gold investors are today. The malaise in this market has lasted so long that many investors have developed amnesia. The case supporting gold ownership might be hard to recall. There are many reasons to own gold, of course. And regardless of our mental dexterity, they remain just as valid at $1,000 gold as they were at $1,200, $1,400, or $1,800 gold. An op-ed in the Wall Street Journal last month labeled gold a “pet rock.” The author gave me a few good chuckles. I was not, however, laughing with him. This kind of mockery is typical of what we expect to see at market bottoms. The conventional media is fat with cheeky “we told you so” articles on gold. Really, I can’t remember the last time I saw a positive gold article from the mainstream press. In isolation, the anti-gold arguments can appear sound. We’re in the midst of a tortuous four-year-plus decline, one of gold’s most severe bear markets. New deflationary threats seem to surface almost weekly. And the dollar continues to kick sand in the faces of the world’s currencies. If you don’t believe in math, or accounting, or balanced budgets, or limits to debt loads—and place faith in the omnipotence of central planners—then gold is easy pickings. Yet, the spirit of Rod Serling must be directing a return to the Twilight Zone because demand for physical gold remains relentless. Physical delivery for 2015 from the Shanghai Gold Exchange hit 1,464 tonnes (47 million ounces) through the week ending August 8, 2015. It was the third-largest weekly withdrawal of gold from the exchange ever. Physical withdrawals have grown 385% since 2009. The April–May period saw gold imports into India up 61% over the same period in 2014—itself a record year. Reports from South Korea show demand spiked in July. Dealers attribute renewed interest in physical gold to lower prices. Google searches for “buy gold” have jumped almost 30% since June, the most since April 2013. The US Mint sold 170,000 American Eagle gold coins in July, the largest single-month sales since April 2013. On a personal note, every dealer I talked with reported record buying volume in July. One said it was the best month in the history of his company. Volume at the Hard Assets Alliance surged. All orders for Silver Eagles and Silver Maple Leafs were suspended from the US and Royal Canadian Mints. They just could not meet demand. Australia’s Perth Mint said its inventories were being “cleared out,” particularly from Asian demand. Delivery times from private mints grew from days to weeks because they couldn’t source the silver blanks needed to fabricate coins. The negative press about gold has reached bubble proportions, sentiment is abysmal, and the gold price is stuck in a downtrend. So, what do these global investors see that compels them to buy more gold and silver? The Fed is like Dr. Frankenstein: it has conducted an experiment to bring to life something ugly. The economy, like Frankenstein’s monster, is alive, but it’s unhealthy and stumbles a lot. It can never be normal if you keep applying the wrong stimulus. The problem: the longer this artificial process continues, and the greater the stimulus, the more severe the likely fallout will be. The world has been turned upside down. Is any of the following really as healthy or sustainable as we’re told? A weak currency is good; a strong currency is bad. Maybe someone should ask an old timer from Zimbabwe or Argentina how that theory turned out. According to John Williams of ShadowStats, despite the end of asset purchases, the Fed monetized 78% of the Treasury’s fiscal-2014 cash-based deficit. Today, there is roughly $4 trillion in global government debt with negative interest rates. The European Central Bank continues its asset purchase scheme of €60 billion per month. The program is scheduled to continue through at least September 2016. Japan injects $700 billion annually into their financial system, roughly 12% of GDP. Just the interest on the nation’s debt consumes over 25% of annual tax revenue. US national debt now exceeds $18.3 trillion. Total debt, including unfunded future liabilities, stands at $61 trillion. There is no mathematical way these debts can be paid or promises fulfilled. It may “feel” like none of this matters today. But eventually, economic and fiscal realities will overwhelm artificially achieved growth and solvency. When that day arrives, it’s those who believed central planners had their backs that will feel foolish. We don’t know the exact scenario the reckoning will take. But we do know that when the limits of debt are reached, a series of economic and financial crises will erupt across the globe. In retrospect, Greece will be seen as the founding member of a rapidly expanding club of insolvent states. And how does gold respond during periods of crisis? During almost every crisis scenario—recession, inflation, terrorism, equity shocks, dollar weakness, untenable debt—gold has delivered protection of wealth and purchasing power to those who hold it. Smart Action: The global banking and financial system is in unchartered territory. The artificial illusion of national solvency and economic growth will vanish without notice. The only rational response is to hold a higher portion of your wealth in gold. As long as US equity markets remain near their current heights, interest in gold from the mainstream investor will be subdued. When the markets correct—either a sudden selloff or protracted decline—investors will quickly recall the portfolio carnage they suffered in 2008/2009 and bail. A selling cascade is hard to stop. The three-week plunge in China’s market that began in June of this year is a good example. It took multiple interventions from the central government to halt the decline as it fed upon itself. The market stabilized, but remains far off its former highs. The percentage of unprofitable companies taken public just hit a record high (for as long as SentimenTrader.com has measured the data). This should provoke further caution for anyone with US market exposure. The question then becomes, how has gold responded to stock market corrections and crashes? Of the 17 major US stock market corrections since the 1970s, gold rose in 11 of them. Three of the six times where gold fell, it likely did so because the metal had also run-up in price prior to the correction—the opposite of the situation we have today. The longest consecutive annual rise in the US stock market is six years. It’s only occurred twice since 1874—from 1898 to 1903, and 2009 to 2014. Smart Action: US equity markets have risen to historic highs. Valuation measures suggest the market is not cheap and that a correction seems inescapable. Now is the time to allocate a meaningful portion of your wealth to an uncorrelated asset like gold. At the current pace of demand growth, at some point soon it will be impossible for supply to meet that need. And don’t look to the headlines for an early alert about when this will happen. At $1,100 gold, approximately 76% of producing gold mines operate in the red (according to Thomson Reuters GFMS). Primary gold producers have cut exploration budgets by one-third since 2011. Of the world’s 10 largest gold producers, only two expect their minimum level of output to materially rise this year. TD Securities estimates that global gold reserves are down 24% from 2011. And 2014 was the third consecutive year of reserve declines. It’s estimated that Canadian junior exploration companies have $5 billion in “questionable” exploration assets. Exploration among Western Australian mining companies is down 30% from last year and at its lowest level since 2006. And a supply/demand crunch in silver has already arrived. Obviously, these trends cannot persist without consequences. It is certainly possible, even probable, that this supply/demand crunch for gold and silver will show up when the next crisis arrives. If that happens, we’d see some real fireworks in their prices. Smart Action: Preparation is not retroactive. Prudent wealth management demands you purchase bullion now, before premiums escalate, delivery delays surface, product choices narrow, or worse… no metal is available at any price. 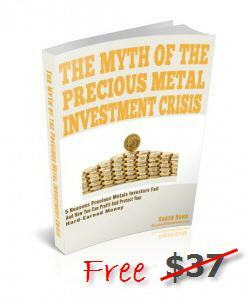 Everyone should hold a small percentage of their invested assets in precious metals. They add diversification and stability to a portfolio. But global developments compel us to hold a higher than normal allocation to gold and silver. Precious metals will be the direct beneficiary of the events above—plus other black swans we can’t predict or foresee. It’s essential to build your position now—especially with prices at five-year lows. For the first time in its history, the Hard Assets Alliance is offering free storage for all metals in the US, Switzerland, Australia, and the UK, for up to six months—until April 30, 2016. And storage in Singapore is free for up to one full year—until October 31, 2016. If you’re not using HAA, this is a perfect opportunity to take advantage of this unique buy-and-store program. Opening an online account takes only ten minutes (mine took eight minutes), funding is streamlined, and buying is easy. Premiums are among the lowest you’ll find anywhere because HAA has access to institutional rates. Your holdings are stored outside the banking system, in the same vaults refiners use to hold their finished product. Delivery of your metal can be arranged at any time, to any location, with just a few clicks of a mouse. This offer expires on October 31, 2015, so act now. Put your wealth protection plan in place before the next crisis event hits.